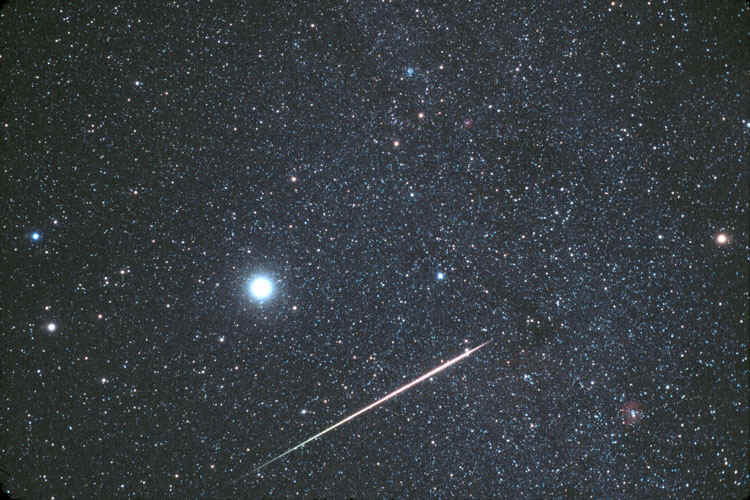 A fireball, one of the brightest meteors of the 2001 Leonid meteor storm, streaks through the constellation Gemini. The different colors of the meteor are created by the ionization of different elements as the meteor burns up through the Earth's atmosphere. Jupiter is the bright object at left center. On the left are Castor (blue) and Pollux (yellow). On the right is Betelgeuse. In the lower right corner is the Rosette Nebula surrounding the open cluster NGC 2244. At top center is the open cluster M35.